TRIPAWDS: Home to 13662 Members and 1544 Blogs. 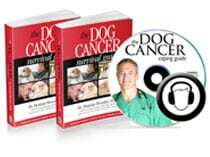 Dr. Dressler’s Dog Cancer Kit includes everything to help your dog fight cancer! If someone could please let us know what kind of things we can expect, what we will need to buy, and if there will be health issues for this little dollie. The current owner said that the mom tried pulling her puppy out of the kennel and the leg tore off.. poor little thing. She stated the vet said it was healed very nicely and there was not infection. She is only 8 weeks old and we would be brining her home in the next couple weeks. Hi to you too! Thanks for finding us and joining our community. You'll be so amazed when you see how awesome tripawds are! Congratulations on your new pup, you are so sweet for adopting her. Well, first off, what's a Morkie? As a tripawd puppy, she will have no problem living life on three legs. She's never known anything else really, so you won't be dealing with a lot of the issues most of us have gone through here. That's neat! And if you're not coping with cancer either, life is good! Ok, so what to expect. Well, you can get a good idea by checking out our Top Ten questions about amputation, here and here. Some of these won't apply to you though. My biggest piece of advice in your situation would be to just take it easy when you start to go on long walks as she gets older. You'll have to be the one to keep an eye out and see if she's overdoing it. Use your judgement. Carry lots of water. Most tripawds can do the same things that four legged dogs can do, but they often require more frequent breaks. Hope this helps. She'll do just fine, you'll see. We would love to see a photos when you have a chance!